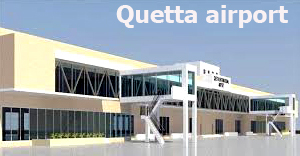 The new beautiful building of Quetta airport has been completed, Prime Minister will have its opening today. Prime Minister Shahid Khaqan Abbasi will reach Quetta today on two days visit. During the visit Prime Minister will have the opening of the Quetta international airport. He will also have the opening of the under construction national Incubation centre. Even so Quetta international airport is the largest international airport but its value was like a railway station in the starting. For its future and present needs the amount of 1 crore and 70 lakh project was started in 2015. According to the extension plan state of the art, two passenger boarding bridge, check in counters, baggage handling system, modern immigration system and national and international going the terminal are build more large and are with modern facilities. In the first phase the construction of the domestic wing has been completed, whose opening will be done by shahid khaqan Abbasi. In this regard, opening ceremony will be held at Quetta Airport, which will give brief to the Prime Minister’s Civil Aviation Authority’s new building. Prime Minister’s Support for Aviation Session Referral. Shahid Khaqan Abbasi will also examine the new building on the occasion. As Prime Minister, his last visit will be Quetta. In this regard, opening ceremony will be held at Quetta Airport, which will give brief to the Prime Minister’s Civil Aviation Authority’s new building. Through the boarding bridge from the passenger plane of the big planes, the terminal building will be carried out in the same direction as the terminal building. Two modern paneering boarding terminals have been installed in the Quetta International Airport. Domestic checking has been increased from Counter to 5 to 12 and Interactive Counter 3 to 12. Domestic checking has been increased from Counter to 5 to 12 and Interactive Counter 3 to 12. Separate VIP lounges have been made for travelers abroad again and again. The space for the VIP passenger has been increased to 30 in the VIP lounges. Similarly comfortable sofas and chairs have been set up for 53 passengers in the international department of VIP lounges. Civil Aviation in the new building and new office block for various Airlines offices have also been built. The parking capacity of the airport at the airport under the underground project has been constructed. 1. Ground floor area has been increased from 45 thousand 904 square feet to 1,250,100 square feet. The floor of the Frost floor has been increased from 23,000 square feet to 87,000 270 square meters. 2. Domestic check-in counters have increased from 5 to 12 and International Counterterrorism 3 has been increased. The immigration counter number has also increased from 3 to 14 for the country’s arrival. 3. The capacity for the passengers to be lodged in the lounge for arrival and departure abroad and abroad. 4. Now there are 432 comfortable chairs in London’s departure lounge now. 5. The number of seats in the lounge made for overseas has also been increased from 260 to 816. 6. Variable 256 RFT instead of 389 RFT in the Arrival converter belt lounge has been set. 7. The Domestic Lounge had a 138-bit racket conveyor belt, now a baggage conveyor belt 156 rft and second 257 rft in the Domestic Lounge. 8. A number 280 inch FT has been set for the first time in the Cake Including Belt International Lounge. 9. The Check In Deporter 240 RFT has been installed for the first time in the Domestic Lounge. 10. The first two executives at Quetta airport were now installed two new exchangers. 11. The boarding board is installed on a secondary and second international side.